If you are looking for a sturdy pallet changing solution, a stationary V-shaped pallet changer can be the right installation for you. The pallet changer receives the load on its lower platform, placed at the ground level by fork lift or by pallet jack. Toppy V-shape is a stationary pallet exchanger built with a unique, strong V shape frame. It is manufactured in painted steel, and with a full stainless steel model also available. All moving parts are operated by hydraulic and electrical systems. The pallet to be replaced is loaded onto a lower platform at floor level by either an electric pallet jack or forklift. 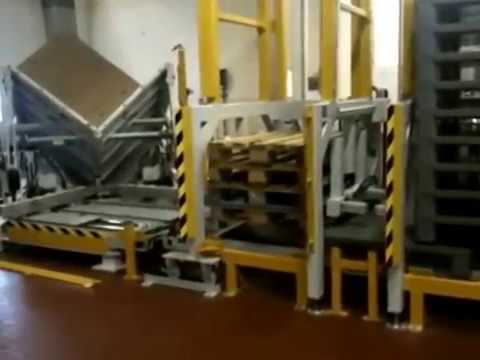 At the start of cycle, a pallet latch secures the pallet to the platform and the upper compactor plate moves down until a sensor detects the top of the load. In this position the plate provides a gentle support to the load. The load, secured by the V-shape frame, is then lifted and rotated backwards. When the load is in the tilted position, the lower platform moves back to the floor and the pallet is released. The operator can quickly and easily replace the pallet at floor level. With the new pallet, the load is returned to floor level and removed.